After a long, cold, and wet winter it’s finally spring! There are certainly some great new styles that you can invest in this season but before you do here are a few fun styling tips you can incorporate into your wardrobe this season that won’t cost you much. Pull your hair back with a colorful scarf. 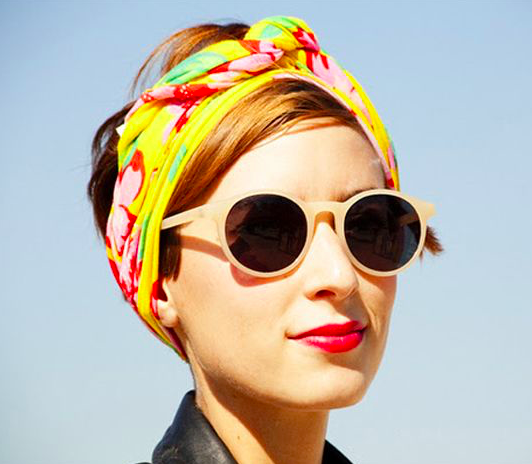 You don’t need to wait for a bad hair day to add a colorful scarf to an updo. Crop your pants. Pants that are long enough to hide your shoes might seem a little out-of-step with today’s styles. Shorten your long pants by a couple of inches and show off those ankles. Wear a men’s shirt as a shirtdress or tunic .There is an abundant number of men’s shirtings available at secondhand stores. Find one that is extra generous, roll up the sleeve and maybe belt it. If it is too short to wear alone style it with a pair of slim cut capris or jeans. Turn your cigarette pants into a pair of summer shorts. Don’t throw out your cigarette pants just because of a few holes and stains—instead shorten them to just above the knee. Wear your bathing suit coverup with a pair of slim pants.If you have a bathing suit coverup try styling it differently—try it with your capris. Add a belt to an oversized tunic.Tunic length tops are great with slim cut pants. The next time you visit your favorite beach resort try cinching a belt around the waist and wearing it as a sundress. Purchase a brightly colored pair of sunglasses.Never get cheap when you purchase sunglasses—your peepers depend on it! You don’t need to drop a bundle for a pair of designer glasses but you do need lenses to protect you for both UVA and UVB radiation. Look for 100% UV or UV 400 protection.